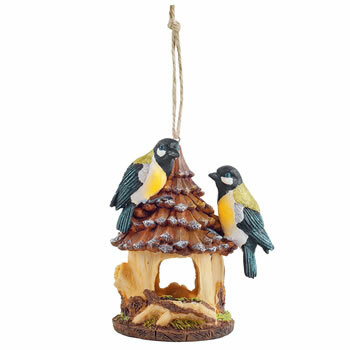 A bright and detailed bird house ornament to hang in the garden, a wonderfully decorative feature and a great gift idea too! Made from resin with hand-finished details, the house is H16 x W13 x D10cm, total hanging length on jute string is 26cm. Weather resistant.